WTF: Adjust Your Head Angle On-the-fly! Ever felt like you’ve needed a slacker head tube angle for descending, while also having a tall bottom bracket height for technical climbs? What if you could have both of these features available to you at the push of a button? A bike that transforms from a mountain goat with masses of pedal clearance for the climbs, into a slacked-out gravity monster for the descents? Sure, German brand Bionicon has already done that, but it’s a little too conservative for our tastes. If only there was someone out there to take the idea to its full potential, and really push the boundaries of contemporary mountain bike geometry. Someone with access to a reciprocating saw, a welding torch and some gas shocks. Well, we have good news for the early adopters out there who can see the blatantly clear advantages of such a design. Introducing the Transforming Bike! Long wheelbase? Check. Low centre of gravity? Check. 43-degree head angle? Check. This week’s WTF bike nomination goes to a clever person who’s used some brilliant ingenuity to come up with a hilarious contraption that transforms from a tall bike into a chopper. And while it’s certainly bizarro, we think you’ll agree that there’s an impressive level of execution going on here! What stated out as a cheap full suspension mountain bike has morphed into something a whole lot more than that. The rear shock has been removed and the chainstays have been lengthened. 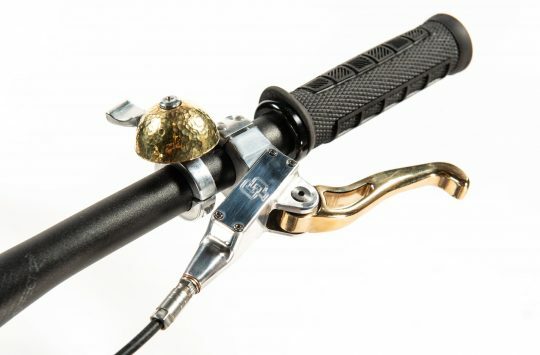 Supporting the rear axle are two gas struts that act as adjustable seat stays, which can extend to ‘push’ the bike high up above the ground to create a tall bike. When the gas struts compress, the seat stay length shrinks to lower the rider back towards the ground. With the addition of two long steel tubes, the front wheel sits way out in front to complete the lowrider chopper look. 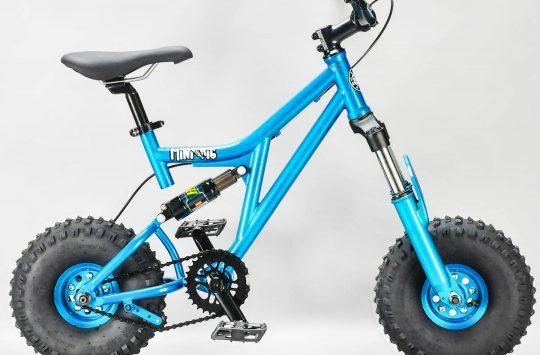 We’re not entirely sure what it would be like to ride off-road, but our guess is that there’ll be just a little bit of flex in that rear swingarm. That said, you could climb over anything with all that ground clearance, like, other riders for example. And in the chopper mode? 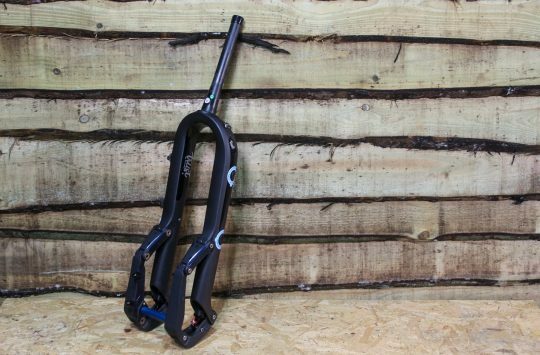 Well, maybe Mondraker only clipped the top of the iceberg with its Forward Geometry system and super-long front centres. Perhaps the Transforming Bike will take that ethos into newer, high performance realms? Love the idea? 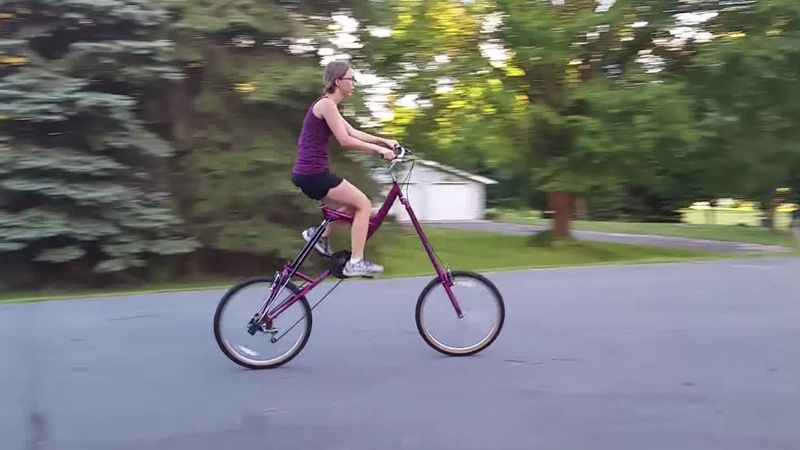 Well make sure you check out the video below of the Transforming bike in action and its seamless on-the-fly geometry adjustment system – it is brilliant, and we want to ride one! Where the heck is her helmet?